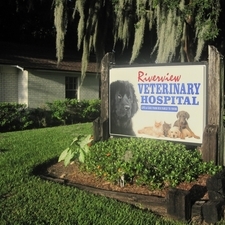 At Riverview Veterinary Hospital, we believe in the importance of preventative care and wellness screening. Many potentially deadly diseases are completely preventable with the right care, and many diseases can be managed much more effectively if they are caught before your pet is sick. To this end, we focus our annual wellness exams on discussing these potential problems and managing the risks specific to your pet. If your pet does get sick or require further treatment, we also offer in house radiology (x-rays), bloodwork and can perform most surgeries. We also attempt to accomodate emergency visits for all of our patients, should the need arise. We strive to provide a comfortable family atmosphere where our clients can feel free to discuss their pets issues and any questions with their veterinarian. We also try to provide multiple possible treatment options - if available - to try to find the best possible care for all financial situations.